Utah. The staid state that slaps you in the eyes with every corner, every turn, every time. The beer is good; commonplace session ales that average 3.2% alcohol by weight, promoting the addition of a second or third without fear of a morning dulled by hangover*. The option of stronger craft offerings, brimming with hipster passion for hops, is also there. The coffee is good, too. Moab boasts two or three excellent places to mainline your java and one even nitro-injecting ice cream so that it freezes in front of your eyes steampunk-style, billowing clouds of cold pouring over the countertop. Coffee and nitro-injected ice cream? Hell yes, welcome to Utah. The people are pretty nice too. The frippery of modern life pales in comparison to Utah’s lifeblood. It’s sole purpose – to get outside, in your vehicle, and make the outback your home. To that end, Utah is absolutely, undeniably, epic. 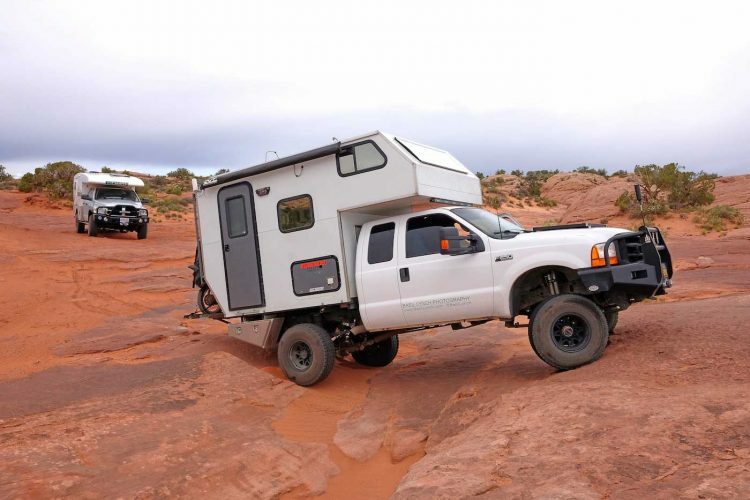 The Utah love of the outdoors brings together an unlikely symbiosis of hikers, RV enthusiasts, rock crawlers, and tourists. There is no ego here. Ego cannot co-exist with a landscape whose magnitude obliterates such a deadly sin; dishing out endless humility to mere humans as they kneel in deference before the red rock architecture, switchbacks, wide open vistas and zest for life – both on the road and camped under dark milky way skies. Utah commands respect. Every corner, every turn, every time. In contrast to Utah’s visual assault, Arizona plays its cards a little closer to its desert chest. Where else could you accidentally drive between the achingly beautiful Horseshoe Bend and the smokey orange ribbons of Antelope Canyon without realizing they were even there? A random glance at a map suddenly reveals two of USA’s greatest sights. Horseshoe Bend, under the weight of a full parking lot and trail of camera-toting tourists, still blows your mind once you crest the lip of the canyon wall. I came, I saw, I cried. Not only is it breathtaking, the point from which you view the splendour is simply unbeatable. Antelope Canyon is equally impressive, crushing other slot canyons in length, colour, smoothness and other ‘canyon-one-upmanship’ attributes. One of those places you feel you’ve already been to – the location not having shied away from having its portrait featured heavily online and in print. But certainly no less astounding when you visit in person. 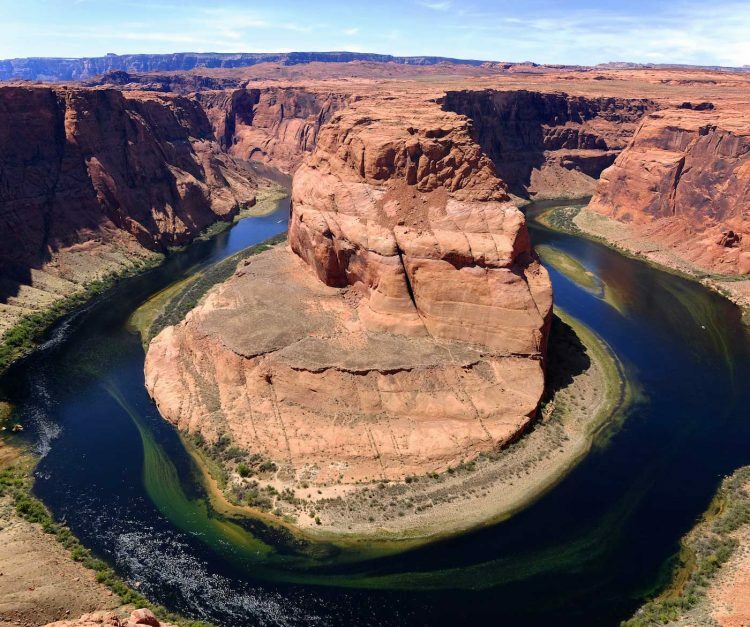 Of course, Arizona has many more riches to see: the small matter of the Grand Canyon, for example. A gouge in the earth notable for its scale and fame. You’ve probably heard of it. This typifies the main difference between Arizona and Utah. The Grand Canyon is non existent until your toes curl right up over its edge. We ascended to the North Rim via the backdoor Forest Service roads, as the main artery – Highway 67 – was still closed for winter. The dirt was impressively smooth for an unpaved road. As we gained altitude, the roads thinned, trees respectfully reaching out, their canopies maintaining their distance from the shell of our camper. The Grand Canyon only giving up its hiding place once we pulled into camp at Fire Point. Boom. You simultaneously recoil from the expanse and rush closer, wide-eyed and mouth expletives. Ultimately, Arizona is a showman and master of the big reveal. Giving the nod to one state or the other feels like a betrayal to the loser. No state deserves to be second best – and both put up a fight worthy of the finest locations in the world. At times the states bicker, naturally rather than legally, over custody of their treasures. 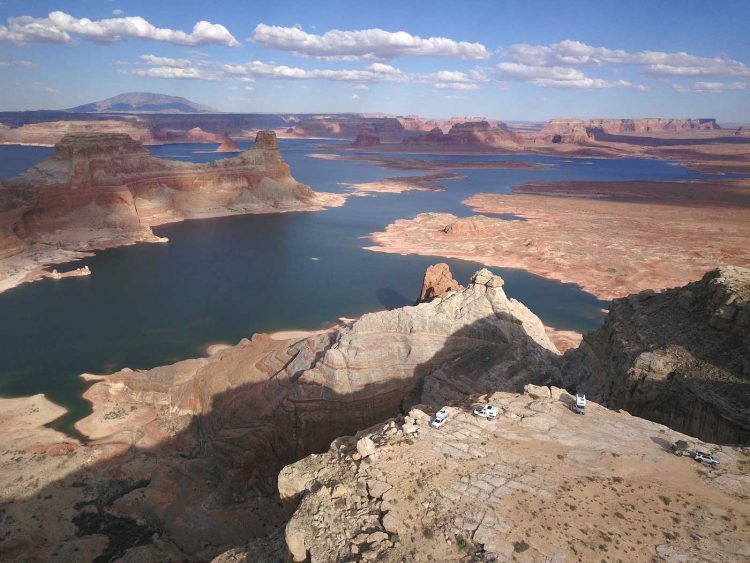 The sullen child Lake Powell, staring at its beautiful shoes as it straddles the parent’s border. Arizona granted majority ownership, but Utah stealing back some of the thunder with its access to the utterly magical Alstrom Point via Big Water, a town firmly suffixed with the UT state abbreviation. The stunning panorama of crystal glittered water contrasting magnificently with the emerging rock formations in ice cream orange and vanilla pastels. Speaking of ice cream pastels, White Pocket is another unwitting participant in the Arizona/Utah tug-o-war. Arizona winning the battle, grasping at the National Monument and holding it within inches of the border. White Pocket was a true highlight. 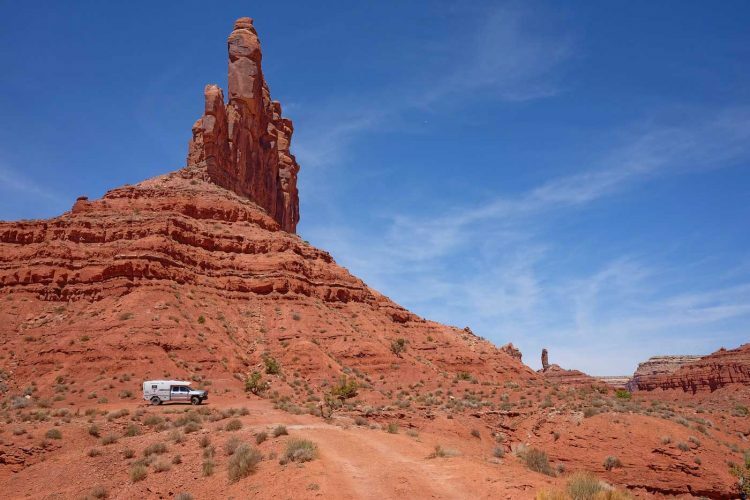 The surprisingly unvisited formations accessed via some three hours of trail driving and soft sand channels just deep enough to make less capable vehicles think twice. White Pocket is a small unpaved lot, a short five-minute hike and a few acres of natural, uncrowded photogenic wonder coming into its own during the golden hours of sunrise and sunset. Its bowls, crests and humps radiant. A congealed mass of sandstone sundae. Zion could clinch the deal on its own. Bryce Canyon, the petite and far prettier cousin to Grand. Taking to the back roads sees you crushing stones along Cottonwood Canyon with its abundance of distractions to stop at and explore. On road you have Highway 12, the powers that be labelling it a scenic highway, both blatantly obvious and unnecessary understatement. Utah has Moab. Enough said. 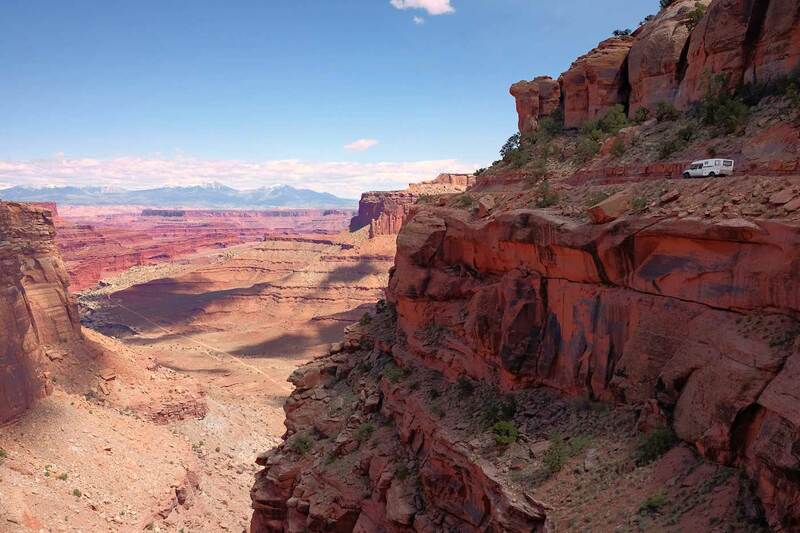 Canyonlands provides more variety of terrain than any off-roader could wish for; the unique Schaefer Trail offering a subdued trail in a stunning cliffside and canyon location. Then, there is ‘The Maze’. A signed warrant for vehicles that don’t have the full arsenal of rock crawling hardware at their disposal. Utah’s reputation is well deserved. It’s storied back roads, rock driving and camping free-for-all attitude runs deep, immovable. As the state’s heavy percentage of Mormons would tell you, Utah is God’s country and they have a direct line to Him. Even the staunchest atheist would fall agreeably silent, no argument against. Follow along our RVing adventures around the world at thisbigroadtrip.com or on Instagram, Facebook and Twitter @thisbigroadtrip. *Of course, this goes without saying, but just in case: Drink Responsibly. Don’t drive and drive. Follow along with Go Rving Canada Facebook, Twitter, Instagram and Pinterest.